​Needing a new van can be a daunting experience with all of the different makes and models available to choose from as well as the different ways to pay for it. Once you've decided the van you want, you ultimately have two options. Traditionally, a new van would just be bought outright with cash or a bank loan; however, another option to consider is leasing. So, how are they different, and which will fit your business best? ​If you decide to buy a van outright then you will have to deal with the consequences of a depreciating asset, because as soon as you drive it off the dealer's forecourt, it starts to lose value. Having said that, many businesses or sole traders still like to buy their van outright because it means that they own it and it is often their most important work tool. As an asset of your business, it also means that if you need to trade, sell or swap it, you can do so whenever you want to or need to. Although it is a hefty initial outlay, if you are able to get the cash together and buy it with your own money, you then have no additional outgoing payments to cover its cost. Alternatively, you can get a loan from a bank or building society to cover the initial cost with fixed monthly payments to repay the loan, making it easy to budget over a long period. Buying a van brings more freedom because it is your own property which means that you can do whatever you want with it without any restrictions. There are no additional costs from another company if you cover a high mileage and you can have the van sign written in whatever way you like - nobody can stop you! If you only use the van for business purposes and not personal use, you can offset the capital allowances against tax and you can offset the van's running costs when you own it. If the van was purchased using a bank loan, you can also reclaim the interest charges against tax too. Your own capital allowances can also be claimed and you don't have to be VAT-registered. Despite all of these advantages to buying a van outright, there are also some drawbacks to consider. For instance, you will be responsible for every element of its upkeep including any maintenance and repair works which may prove too much if you are a high mileage van user. The costs of breakdowns and repairs can be crippling on any business. It will also be your responsibility to insure and tax the van as well as footing the bill for wear and tear items such as tyres and clutches. A typical leasing agreement is not like buying a van because you will never actually own it. However, here at Loads of Vans, at the end of your contract you can sell the van to a third party and keep 99% of what you are able to sell it for. 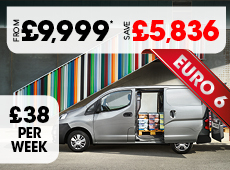 Alternatively, you can keep using the van for just £8.33 + VAT per year with nothing else to pay. This then becomes a rolling contract and the same two options are offered to you every year. Instead of a large initial outlay, you will pay a deposit and then a fixed monthly fee for a fixed period, usually between 24 and 60 months, for the use of the van. The main advantage of leasing a van is that budgeting is made easier thanks to the fixed monthly cost and the outright cost of a van is removed from the company's books. The cost of leasing payments are allowable against tax, so you won't be losing out here when compared to owning the van outright and our Financial Lease agreement will give you 100% tax relief on all of your payments. Thanks to the fixed period of the lease agreement you will know exactly when you need to get a new van. Most leasing agreements also come with maintenance packages so that you don't have to worry about servicing and repairs which can become costly. Usually the downsides of leasing a van are within the terms of the leasing agreement itself. While it helps with monthly budgeting, it can also very restrictive in terms of mileage and the condition the van needs to be kept in. Most leasing agreements will come with a set mileage limit and a fee for every mile you exceed. Similarly, a typical leasing company will expect the van to be returned in good working condition and may be restrictive with any sign writing; or any permitted sign writing will need to be completely removed before handing the van back. However, here at LOV, there are NO restrictions on the mileage you do or condition the vehicle is kept in.